The book of balance teaches you the art of balancing. You'll learn how to use your body both to feel when you are balanced and when you are going out of balance. If feel yourself going out of balance, then you can take the steps necessary to stay balanced. And I show you how to do both. I've used the exercises in this book to teach both older more experienced individuals as well as young go getters. I've taught people how to handstand and headstand with greater ease and more importantly I give students smooth progressions so that it is simple to move from where they are to where they want to be. Although this book doesn't deal with handstand or headstand, it provides the basics that you need to understand so that you can approach these poses with greater ease. And it shows you how to feel when you are balanced. The really cool thing is that balance is actually quite simple when you understand how to practice it. With this book I explain balance simply so that you can get on with understanding it and practicing it. I teach you the principles of balance, and give you exercises so that you can experience those principle ideas for yourself. With an understanding of how to balance, you can work towards any balance pose, even ones that aren't included in this book. 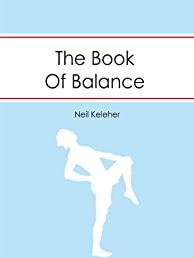 Most of the balance exercises in this book involve standing on one leg or two, but there are also some fun balances that require a bit more body control and awareness. However, I show you how to train those qualites. And I show you how to do these exercises so that they feel good at the same time. You'll want to do them. Learning to balance is very much like learning to drive a car. In a lot of cases you simply need to be told how to direct your senses and how to respond to what you sense. Use the speedometer to see how fast you are going. Use the brakes and accelerator to change how fast you are going. Learning to balance can be just as easy. And where some balance exercises can be a little bit too challenging, I show you how to break them down into easy to learn chunks. After all, you don't learn to drive a car on the highway! Learning to "drive your body" can be the same. You learn basic skills in isolation and then you work towards more complicated tasks. But as well as balancing on one leg or two, or balancing on your hands in crow pose, this book also teaches you to understand the difference between empty and full and how it pertains to feeling your body. If you've ever wanted to understand how to use your foundation like a tai ji master, this book explains the basics. You may not end up flowing like water, but you'll be on the path towards it.